Twice Jokes Around in "Knock Knock"
To say that Twice had a great 2016 would be an understatement. Their popularity exploded with the infectious “Cheer Up“, followed by meme inspiration “TT“. If you didn’t know either of those songs, then I’m assuming you literally got into K-pop today because Twice’s music was everywhere. Less than half a year later, the peppy group returns to answer the mystery ending of “TT” with their newest release “Knock Knock”. For those of you who haven’t watched “TT”, let me catch you up real quickly. Basically, some kids went trick or treating and found themselves at Twice’s quirky mansion. The girls switched their wardrobe between pajamas to Halloween costumes. At the end of the video, the kids are alone in the house when loud knocking causes them to turn towards the camera with horrified faces. We see the “To be continued…” ending title as music plays. If anyone caught it, that music turned out to be the beginning of “Knock Knock”. It’s a minor detail, but I love the connection here. Onces probably lost their minds when they discovered it. Knowing that the videos are linked, viewers are left to piece together the mystery of what happened to Twice in this house. Does this mean they’re ghosts? If they are, how did they die? Thankfully, “Knock Knock” gave us relatively conclusive answers that weren’t difficult to figure out. The reason Twice wore pajamas in “TT” was because they were having a slumber party in “Knock Knock”. As typical of most slumber parties, we see the girls jumping on beds, having pillow fights, and being cute beyond everything. 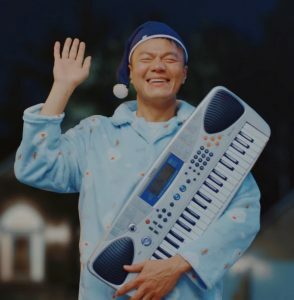 There’s even an unexpected cameo by JYP, who shows up in his jammies with a keyboard. The girls weren’t keen on inviting him to their overnight soiree, and their reactions to JYP were priceless. After his appearance, there’s another knock at the door. The girls discover a storybook with pictures of fictional characters. The characters just happen to be the ones Twice portrayed in “TT”. Things start to come together when the girls notice it’s snowing outside. They rush outdoors to play but get locked out of the house in the process. As they pound on the door (which is silly considering nobody is inside when this occurs), we see the clock flash forward to the kids in the house, looking terrified by the sound of knocking. Knowing all of this, we could assume that poor Twice froze to death, and their spirits took on the fairy tale personas from that book they read. If that’s the case, is it possible that JYP was an evil goblin who cursed them after he was rejected? Or maybe this is a cautionary tale about why you should always designate someone to stay behind to let everyone back in. Whatever the case, I’m positive that the meaning behind what happened isn’t that complicated. Nothing against videos that make you think, but sometimes I need a mental break from theories. “Knock Knock” is the breather that you can take for face value. It’s the kind of K-pop video that a lot of fans appreciate because it’s pure fun. I loved the stop motion technique used throughout the video. It may appear that it was used during the chorus, but upon second glance, I think it was probably just the frame rates being sped up slightly. Either way, it made the dance look better by matching their moves perfectly with the beat. I also liked the editing techniques applied to splice together the different outfit and background changes. The combination of all of these video techniques played into the bright energy of the song. Twice has branded themselves with a lighthearted whimsy that isn’t too cloying or coquettish. I appreciate that this video builds upon that image by showcasing their individual personalities. We see this in the cuts of the members that’s split into a triage of colorful backgrounds with three different styles for each person. However, one of the most memorable displays of their personalities was probably when they came down the stairs with their own signature move. Bonus points to Jungyeon for awkwardly trailing behind the group at the end to wave at the camera. There were a lot of adorable moments in this video, which might not appeal to fans with an aversion to aegyo. Personally, I’m here for it, especially because this is how fans came to love Twice. Some will argue that this video was basic and boring because it didn’t involve a deep story line, flashy cinematography, or complex choreography, but that’s not who Twice is. Fans love seeing them act silly and playful with each other. It’s simple fun and there’s nothing wrong with that. I appreciate this video for what it is — a cute display of the members’ personalities, both individually and as a group. The slumber party bit is cliche, but I like the tie-in to “TT”. Obviously, they can only go so far with this concept, and I’d like to see them grow out of aegyo mode as the members mature. However, I don’t want them rushing things before they’re ready, so for now, I’ll accept where they are.